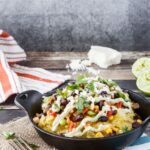 A healthy, creative southwest spaghetti squash bowl topped with southwest succotash and avocado crema. So good you’ll forget it’s good for you! Remember back towards the beginning of January when I announced it was time for me to stop being a fatty? It’s about time I give you an update with how that’s all been going. My buddy Steve and I have been going to the gym several times a week before work. It’s hard rolling out of bed in the pitch black knowing full well it’s stupid cold outside. But we’re committed. He’s getting married in July and we need to look good in tuxes. Weeknight take-out dinners have been replaced with strategic healthy cooking. All junk food snacks have been hidden from sight. And I managed to only take a single bite of those homemade brownie sundae klondike bars I made. That was the toughest moment of my “diet” so far. I had to dig down deep for some willpower. And, in three weeks, I’m down 14 pounds. I still have about 20 pounds to lose, but to know that I’m on the right track is a great feeling. We can do this! So I could tell you 2 things right now. I could try to make a case for how spaghetti squash tastes just like pasta and blah blah blah. But that would be a complete and utter lie. It doesn’t taste like pasta. What it does taste like is spaghetti squash. And you know what? That’s okay, because spaghetti squash is delicious and like a bajillion times healthier than pasta. So although it’s not pasta and doesn’t taste like pasta, it does make for a great base to build on tons of different flavors. The southwest succotash has the normal suspects… onions, peppers, jalapeno, black beans, corn, lime, and some of those Mexican-y spices. But I threw in some cooked edamame as well simply because it was lying there in the freezer looking at me and it adds a nice pop of color. Feel free to omit that if you’re not feeling it. No matter what, don’t skimp on the avocado crema. 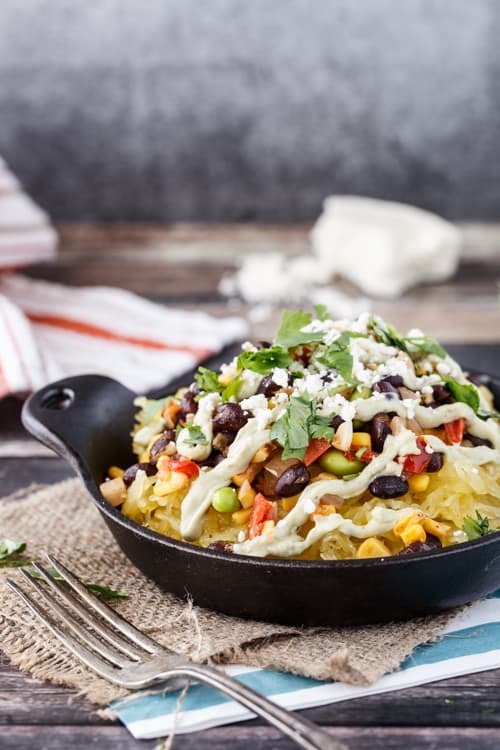 It’s totally crucial to maximizing the full enjoyment of this Southwest Spaghetti Squash. And since it’s made with Greek yogurt, you can go nuts with the stuff. Preheat oven to 400°F. Carefully cut your spaghetti squash in half with a large, sharp knife. Remove seeds and stringy guts, and brush the cut sides of the squash with 1 tablespoon of olive oil. Season with Kosher salt and freshly ground black pepper. Place spaghetti squash, cut side down, on an aluminum-lined baking sheet and roast until tender, about 45-60 minutes. Meanwhile, heat remaining 2 tablespoons of olive oil in a skillet over medium heat. Add onion, red bell pepper, and jalapeno. Season with Kosher salt and cook for about 4 minutes, stirring occasionally. Add garlic, cumin, paprika, and Mexican oregano, and cook for 1 more minute, stirring to avoid burning garlic. Add beans, corn, and edamame. Season with Kosher salt and freshly ground pepper, stir to combine, and cook until heated through. Squeeze in the juice of the lime and give it one last quick stir. Divide spaghetti squash among four bowls. 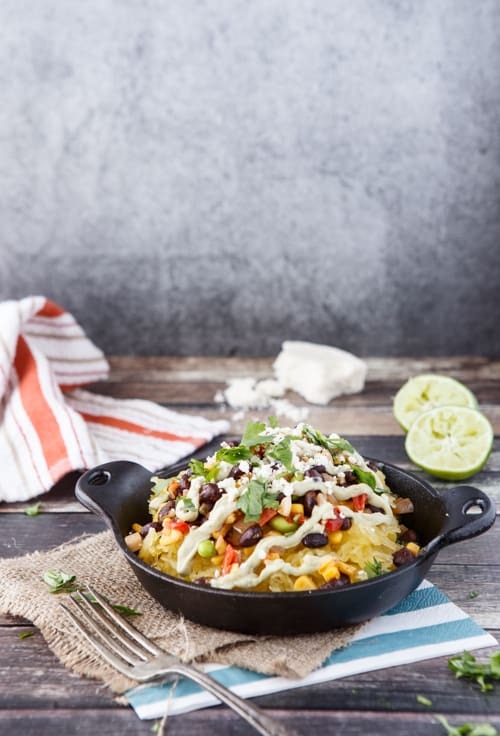 Top with southwest succotash, avocado crema, crumbled queso fresco, and cilantro. Combine avocado, Greek yogurt, lime juice, garlic, and extra virgin olive oil in a food processor until smooth. Season with Kosher salt and freshly ground black pepper. Needless to say it, I’m a huge fan of fan spaghetti squash, especially when loaded with a mixture of mouth watering ingredients. Awesome recipe! Thanks so much Mike and virtual high-five right back at ya, haha. Yes, spaghetti squash is pretty darn awesome… I’m a fan and am having fun experimenting with all sorts of different flavors. this recipe looks awesome, just a great way to inject loads of flavor into squash. Hahaha, I know. So many people said the same thing to me. My body loses weight really easily… but it also gains weight really easy! The hard part is keeping it off! I know, the klondike bars keep looking at me every time I open the freezer! This looks very decadent … but it isn’t, of course. Sounds like a lovely combination of flavours. I guess that queso fresco is a crumbly white cheese? Could I substitute something like feta? Shut the front door! This looks amazing Chris. I am totally on board with you and the spaghetti squash thing, does not taste like pasta at all but I actually think its better. Has a sweet taste which goes perfect with any additions you add to it. And LOVING the Southwest twist you took on this. Totally making it and will have to do a double dose of that avocado crema, more so my husband can have some because I might eat all of it!! Pinned! YAY for your weight loss, Chris! I think this looks awesome (and you know I won’t skip the avocado crema!). I’ve been trying to cut back on my pasta intake, too — I have found quinoa pasta and brown rice pasta to be pretty good substitutes as well. Thanks Ninj! I am a huge fan of quinoa pasta… there is a really great one at Whole Foods in a greenish box that has a great texture just like the real deal. “He’s getting married in July and we need to look good in tuxes.” Haha, I literally laughed out loud. Congrats on the 14 pounds! That is amazing! And this recipe is also amazing! I am a huge fan of anything spaghetti squash and anything southwest style. So this is basically a winner in my book. Yummm! Definitely getting pinned. Thanks so much Erin! Darn straight we need to look good in those tuxes! Congrats on your success so far! That’s awesome that you’re sticking with your goals! And some impressive willpower to only have one bite of those awesome bars! It was an amazing moment of willpower for sure! Once in a while I get lucky with those things 🙂 I know, I totally crack up too when I read that! Congrats on the weight loss Chris, that is SO awesome!!! 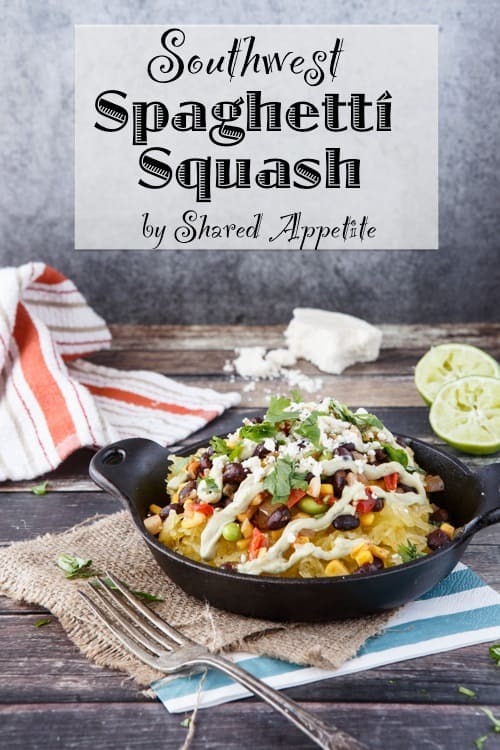 I love Spaghetti squash and I SERIOUSLY need some new ways to eat it…and this looks like just that. And I definitely lol’d @ “it doesn’t taste like pasta. It tastes like spaghetti squash.” Someone has to be honest! I want that avocado on all. the. things! Thanks so much Taylor! I’m always looking for new ways to eat it too! Hahaha, I speak the truth! Wow. Great job. It sure is hard to keep away from the food as a blogger. I tell myself only a bite and then it’s so good I can’t stop. Keep at it. Sounds like you’re doing well!. Looks like the perfect combination of southwest flavors. Yum! Hahaha that’s the problem I have normally. Oh, just one bite. Oops, I just ate the whole thing! Or, ooooh a new restaurant opened up and I “need” to try it for the blog! This dish looks deeeelicious! Congrats on the weight loss! That’s awesome and yes, you can do it! I happen to love Spaghetti Squash, but thank you for being honest that it does not taste like pasta. So many pass it off as being the same. Um, it’s not. It’s a great substitute and lovely but no, it’s not the same. Have a great weekend! Haha thanks so much Tina! I appreciate the encouragement! Yes, it’s totally not the same! Great substitute agreed, but no one try to pass it off as pasta! I love this twist on the spaghetti squash. I love the mixture of flavors! I usually just make mine with a little bit of garlic and olive oil. Congrats Chris! I’m sure you’ll get there in no time! 14 lbs in one month…wow! Congrats to you! Those sundae bars look TO. DIE. FOR… only taking one bite is a seriously huge feat. Those look SO good. This spaghetti squash looks so good, too! Thanks for being real about it not being a dupe for pasta. Thinking it’ll be just like eating a plate of spaghetti is just setting yourself up for disappointment in my opinion. But knowing you’re eating spaghetti squash with a bunch of awesome flavors (especially with that incredible sounding avocado crema!) sounds satisfying in the utmost. Yum! Thanks so much Alyssa! I know… it was shocking that I had willpower in that moment. Even my wife was shocked. She ate a whole one happily while I watched. It was painful to sit on the sidelines. You are totally right. It’s not pasta and doesn’t taste like pasta, but IS a great vehicle for adding lots of flavor. Love this! Haha it’s a pasta imposter! As always, a lovely meal and totally gorgeous photos go back it up! Wow, 14 pounds?! I’m so impressed! You clearly have some great willpower if you were able to resist those delicious looking Klondike bars! I love dishes like this one, that are healthy but that do not sacrifice any flaovr. This looks amazing! We have not found a good spaghetti squash recipe…up until right now! this is great! avocado crema! yum! 14 pounds in 3 weeks!? You are my hero. I need to lose a good 10 pounds or so ASAP, and this dinner looks like a great place to start. Thanks for an awesome recipe, and keep up the good dieting, exercising, and blogging work! This looks like such a DELICIOUS recipe! Congrats on your weight loss….that’s incredible! So glad you shared this “secret weapon” recipe at Saturday Night Fever! Pinning! !